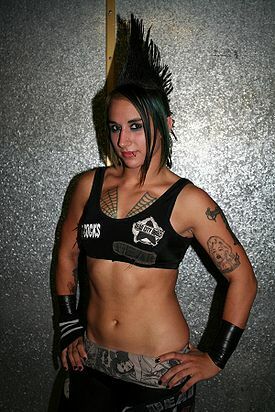 Christina Von Eerie has wrestled for wrestling promotions all over the west coast with companies like PWR (Pro Wrestling Revolution), PWG (Pro Wrestling Guerrilla), XPW (Xtreme Pro Wrestling), TNA and PCW (Pro Championship Wrestling). She made her way to Asistencia Asesoría y Administración (AAA) in Mexico. She made her debut in AAA on March 12th, 2010, as a member of La Legión Extranjera at the Rey de Reyes show in Queretaro in a three way battle in which she teamed up with Sexi Star and Rain to take on Faby Apache, Mary Apache and Cinthia Moreno. Won the AAA Mixed Tag Team Championship with Alex Koslov. In 2014 competed at the Masked Mania event. This page was last edited on 23 May 2016, at 07:10.